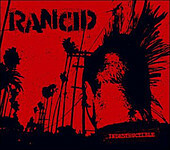 Rancid's sixth album, Indestructible, finds the Bay Area punk modern legends delivering their best album to date. Consistent, strong, and wide ranging (including ska and pop influences of previous releases, while also experimenting with spaghetti western and even a touch of tropical pop). Rancid doesn't lose their focus while they stretch their sound (as they have done on other albums), and they don't let up, concentrating on what they know best - straight ahead, Clash-influenced punk rock. Here is an album chalk full of 19 songs, several hits (the title track, "Start Now", "Fall Back Down", and "Arrested In Shanghai", to name a few), if only MTV and radio was as fired up on Rancid as they were in the mid-to-late 90s. Regardless if they ever have a 'hit' again or not, Indestructible finds Rancid at the top of their game, front man Tim Armstrong penning some of his best songs yet. Aptly titled, Rancid hasn't lost a step and shows no signs of doing so any time soon. So, pick up this album and revel in the fact that attention or no attention, Rancid doesn't seem phased. They instead choose to just keep creating great music that relives the glory days of punk while stamping it with their own touch, and ensuring punk has at least one band these days not killing it with their MTV, watered-down sounds. I'll give this an A-.